Note from the year 2013: I wrote this a year ago, and sort of let it lay in the draft hopper out of apathy. It’s still all true, but I would add a small epilogue: I did finally get the software installed after two weeks of effort and lots of repeated system admin tasks…. and it sucked! The game interface is moronic, you have very little control over individual ships beyond steering them and hoping for the best, and it’s a bit of a yawner. Not really worth giving an in-depth review too. Kind of anti-climatic after all that work, no? I have to stress that Storm Eagle, cited here, did not create the software I’m trying to install in this transaction, so I can’t fault them directly for that, that’s all on Totem Software’s head. In the end, I wasted my money, and went through a lot of stress, to boot. I’m posting this a year later, really because it amuses me more than it angers me. The so-called customer service rep’s replies become blander and less officious as the exchange continues, and in the end I wondered if he could type that drivel with a straight face. They are having a sail on Totem Games’ VICTORIAN ADMIRALS collection for roughly 30 bucks. This is just ducky for a guy like me who’s nuts for the pre-dreadnought Age of Steam naval conflict era– I have reservations about the Totem Games interface– it’s a little clunky and not exactly inspirational, but the art is lovely and the history is obscure. So I did a mental version of “Yipppeee!” and ordered it. Full disclosure: I just ordered it. This is TOTALLY my fault for jumping and not looking. Don’t even bother lecturing me or shaking your head. I didn’t think about reading the damned fine print. I did zero research. I saw something about digital delivery, but so what? I’ve ordered games from Matrix Games with a digital delivery option, I just got a download code, downloaded the thing and that was it. I’ve even ordered from GOG.com in the past, and though it was slow, I downloaded their version of digital delivery. So what could possibly go wrong? Without reading much more than that, I paid by paypal, and was then told I had to download the STORMPOWERED application which is the way they were going to send me VICTORIAN ADMIRALS. I should have had alarm bells going off at that stage, but I complied, downloaded their “STORMPOWERED” client application, which is somehow beneficial to the software delivery process. Digital Delivery, as my hipster younger friends tell me, is the way of the future for computer programs. That’s progress. FOUR DAYS LATER, after frequent attempts to download the product I PAID FOR, with NO CHANCE OF A REFUND, I realized that A) I was foolish and should have read the fine print, and B) this ain’t no way to run a railroad. Because we’re in the age of “Digital Distribution”, Storm Eagle Software has essentially adopted policies that preclude the customer getting a refund if he or she is dissatisfied, with no redress whatsoever. There are no reasonable alternatives offered if the client doesn’t work– I can’t get a CD download (hell, I’d even pay extra for it now). I can’t access the software from a secure FTP site, like I can with Matrix Games. Throughout the process of dealing with Storm Eagle Software’s so-called customer service agents, I have been told that this is essentially my fault. I have followed their instructions. I’ve tried to download this at home and at work. The STORMPOWERED client, essentially, is defective. It will apparently work if I add exceptions to my anti-virus software and log in as an administrator to install and run it. I have done so, and it still doesn’t work. So, apparently, I’m also supposed to do all these extra system administrator tasks to download a file. I rapidly got fed up with the defective software, requested a refund, and was told that no refunds are granted. I asked for a CD delivery, and was told they don’t supply software that way. I asked for a FTP download and was told they wouldn’t make an exception for me. During the four days of increasingly fruitless “customer service” emails from the while, every message ended with a cheerful variant of “We’re committed to doing whatever it takes to make sure you get your product”. Except, of course, CD Delivery, FTP delivery, or any other reasonable option to satisfy a very disgruntled customer. Do you think I’m over stating this? Maybe, being a bit of a drama queen? Read on by clicking below. FROM Storm Eagle Software’s CONTACT US form, after several failed attempts at loading their software. Subject: You are making this way too hard. You are making this way too hard. I have tried to log in with the information that I purchased VICTORIAN ADMIRALS with, at which time I was told I had created a new account. I used this email address (my email) and the password I specified. Your downloadable client refuses to log me in. I give up. I’m defeated. Please either send me the damned file or refund my money. This is too hard. RE: You are making this way too hard. It was not asking you to create a new account. This was a procedure to make an account username for the account you created at purchase time. When you got to this dialog, you were already successfully logged in. This was just to modify the account information by creating your unique account username. Currently there is a bug where some users see a repeated request to create an account username on each login. This problem is currently being fixed. At this juncture, I have the special software installed on my computer. I have an internet connection. Windows 7 at home. I have an account, allegedly linked to: (this email address). I have a password, which I used to register with and apparently I can log in to the website with. I have been told that I have purchased software (Victorian Admirals). I was also told to download and install the special software to download my copy of Victorian Admirals. I have downloaded it and installed it, see above. The software prompts me to type in “Identity” and “Password”. I tried typing in (my email address) and my password I registered on the website with. It doesn’t do anything when I click “Accept”, other than blank out. If you did not request your account information, please disregard this e-mail as no one else will see it. It continues to blank out. I am now out of ideas. I do not want to have to read the manual to do something as simple as downloading software. Now, please, either send me the file via email, give me a secure FTP I can go to via browser, or refund my money. I have purchased this license, it should be mine. Please make sure your antivirus software is not interfering with StormPowered and its ability to connect to the internet. You can do this by creating exception rules in your antivirus and firewall software. Please refer to your software specific documentation for instructions on how to do this properly. The retrieve account information link has been changed to the correct script to reset your account password. Please do this if you are still having trouble after setting up exception rules in your antivirus and firewall software. Subject: Re: You are making this way too hard. Please just refund me. I can get this software elsewhere where it isn’t nearly this difficult. I apologize for the inconvenience but we have a strict no refund policy. We are willing to work with you to do whatever is necessary to get your games working properly. Have you tried setting up the exception rules in your antivirus and firewall software? Then try to log in to stormpowered again after resetting your password. No refunds? Are you serious??? I guess you fellows have bilked me out of 30 bucks, then. Yes, I have tried downloading it from home. I have tried downloading it at work. I have tried downloading it at the local Starbucks. The software JUST DOES NOT DO WHAT YOU SAY IT IS SUPPOSED TO DO!!! Why can’t you just send it to me on a CD? Why can’t I just get it from an FTP site? I will attempt, AGAIN, to resolve this thing with firewall mods and changing my password. After that, I’m filing a report to the BBB. I realize that probably has zero resonance with you, but your so called customer service policies are absurd. I’m sorry you feel this way, be we have our no refund policy posted in several places on our website. We do not do CD distribution, our services are all digital. What operating system do you use? Also what antivirus and firewall software do you have installed? We will do whatever we can to make sure you are able to play your games. Yes, I am picking up on that sincere sorrow vibe in your reply. It took me a little bit of drilling, but I found your policy. I would hardly describe this as posted “in several places”. I am using Microsoft Forepoint and Endpoint. I have logged in as security administrator, I have made exceptions. I have uninstalled and reinstalled the client. Three times, in various locations, as an administrator. There has been no change whatsoever in results. I do NOT WANT TO DO THIS AGAIN. Given that I am now on the verge of having Storm Eagle Studios rip me off for 30 bucks for nothing but a defective client, is there a way I could have access to a FTP folder (and just a FTP folder) for a limited time, to download the install file? I have put in far too much time trying to achieve a simple download already, I would consider this a reasonable outcome. Reinstalling the client in different locations will not use the same antivirus exception rules as the file is in a different location. Allow StormPowered to install to its default location. Then create the exception rules. 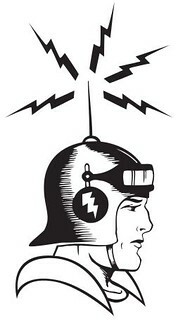 A test of these credentials has been successfully used to log into StormPowered. 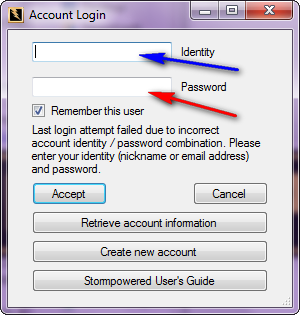 Once logged in, you should see a dialog saying to create the account username. There is currently a bug in this form that is actively being looked at. For the time being, when you get to the main form that shows your contact info, click cancel and it should allow you to get to StormPowered. When you say it goes blank, what exactly do you mean? What goes blank? StormPowered may be attempting to download an update. If so, the login dialog will go away and you will see the ‘STORMPOWERED’ splash screen in the middle of your screen. If the login attempt has failed, the login window will appear once again and say that it has failed and for what reason. To answer your question regarding what I mean when I say Blanked out, please observe the attached illustration for clarification. In the field indicated by the blue arrow, I typed several variations of my account name, notably (my email address) or the customer number generated by your program or website. In the field indicated by the red arrow, I entered the password I created on your website, then the one suggested by tech support (btw, I never received an email indicating that this number was NOW my password, for your information). When I hit the Accept button, the information in the fields indicated by the blue and red arrows disappears and nothing happens. This is what I mean by “Blanked out”. Other, relevant information to this screenshot. I CAN use the button for “retrieve account information” and it will send me an email giving me a new customer account number and password. After doing some research into your antivirus software, I can safely say that your issue has to do with it. Microsoft Forefront Endpoint is a business antivirus solution, meaning it’s generally deployed onto company laptops, desktops, and overall network traffic. Even if you have created exception rules in your antivirus, if you are attempting this from work, the antivirus on the network will still stop the traffic. It’s even possible that there are admin specific settings within the antivirus software that can only be modified by your tech support specialists. Have you consulted them at all regarding this issue? Have you tried installing and running StormPowered on a computer that is not provided by your business or in your business office? Please try running StormPowered on a home PC that does not have such an overprotective antivirus software such as Microsoft Forefront Endpoint. When it blanks out, that means the login was incorrect, or it was unable to process the login due to a connection issue, which at this point is more likely the case. Most businesses prevent software like this from running for security reasons, and from what I’ve come to understand based on your situation and repeated attempts, it can only mean the business is preventing this software from running properly for whatever reason. I have no intention of installing the program on my work computer. I merely want to download it so I can cut a CD. This is the basis of my intense frustration with your insistence on using a client to do what a website should be able to do. I have tried this at home, and can say without a doubt that I have experienced the same response with your client at home. At home, I am using AVG. I have actually turned it completely off (not in resident memory) and re-downloaded the software and installed it AS an administrator, and the exact same response occurs. By that, I mean, the client blanks out (See previous explanation). So, can I download this from an ftp site now? Please? I really do not want to use your client. Our software is not available in a format that can be copied to a CD and used without StormPowered. It is clearly stated during the checkout process that all purchases are delivered via our StormPowered client software. I’m sorry but we do not provide ftp site access for individual download of software purchased on StormPowered. You mentioned that your antivirus software was ____________, it was under this circumstance that I thought you were attempting this installation on a business computer due to MFE being a business antivirus solution. You did not mention before that you’d tried on another computer that had AVG. When installing at home, did you also create the exception rules in AVG as well? Also make sure to pay close attention to your firewall software as well, even if your antivirus is set to allow it, certain firewall softwares will still prevent the necessary communication. Well, you guys have taken me for my thirty bucks, then. Yes, you can assume from my previous statement that I have turned AVG off to attempt this installation at home. You can assume I have admin rights on my home computer. To state this fact for the third time by my count, Absolutely nothing happens, beyond the previously reported blanking, blinking and reset activity. I’ll even try deinstalling the AVG tonight when I get home, and reinstalling it after I install your software, if that will make even a shred of difference. At this stage, I seriously doubt it. What state is Storm Eagle studios incorporated in, please? And could I have the business address? Thank you. Note from the year 2013: I sound like I’m getting all threatening with them towards the end there, don’t I? Well, I never bothered filing anything to the BBB, because, really, I was being whiny and didn’t have much of a case. They aren’t hiding that they distribute this way, they just (back in 2012 at least) did it in a very poor manner. They didn’t have a backup plan OR issue refunds when something didn’t work as advertised. I’m still puzzling over the no refund thing. Don’t they stand by what they sell? Has that ethic vanished from digital software distribution? Apparently. Oh man… this is why I stick to cardboard. As to where “Free Union, VA” is, Mapquest tells me that they are located near Charlottesville. LOL! I looked up that exact location and when you do satellite view, it’s a FARM! Maybe you can get a cow or pig for you troubles? I know Norm Koger, who created Age of Rifles, had something to do with that company. I think he might even live in VA.